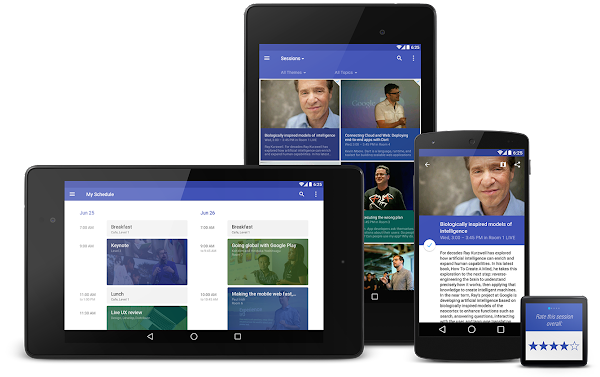 The source code for the 2014 version of the Google I/O app is now available. Since its first release on Google Play a few weeks before the conference, the I/O app was downloaded by hundreds of thousands of people, including on-site attendees, I/O Extended event participants and users tuning in from home. If one of the goals of the app is to be useful to conference attendees, the other primary goal is to serve as a practical example of best practices for Android app design and development. In addition to showing how to implement a wide variety of features that are useful for most Android apps, such as Fragments, Loaders, Services, Broadcast Receivers, alarms, notifications, SQLite databases, Content Providers, Action Bar and the Navigation Drawer, the I/O app source code also shows how to integrate with several Google products and services, from the Google Drive API to Google Cloud Messaging. It uses the material design approach, the Android L Preview APIs and full Android Wear integration with a packaged wearable app for sending session feedback. To simplify the process of reusing and customizing the source code to build apps for other conferences, we rewrote the entire sync adapter to work with plain JSON files instead of requiring a server with a specific API. These files can be hosted on any web server of the developer's choice, and their format is fully documented. Storing and syncing the user's data (that is, the personalized schedule) is crucial part of the app. The source code shows how user data can be stored in the Application Data folder of the user's own Google Drive account and kept in sync across multiple devices, and how to use Google Cloud Messaging to trigger syncs when necessary to ensure the data is always fresh. The project includes the source code to the App Engine app that can be reused to send GCM messages to devices to trigger syncs, as well as a module (called Updater) that can be adapted to read conference data from other backends to produce the JSON files that are consumed by the I/O app. We are excited to share this source code with the developer community today, and we hope it will serve as a learning tool, a source of reusable snippets and a useful example of Android app development in general. In the coming weeks we will post a few technical articles with more detailed information about the IOSched source code to help bring some insight into the app development process. We will continue to update the app in the coming months, and as always, your pull requests are very welcome!